An aid truck enters Syria from Turkey at Turkey's Oncupinar border crossing on the Turkish-Syrian border in the southeastern city of Kilis, Turkey, Feb. 7, 2016. The United Nations Security Council is holding a private briefing Wednesday on the humanitarian situation in Syria, where government forces backed by Russian airstrikes are waging an offensive against rebels in Aleppo. The operation has sent tens of thousands of people fleeing the northern city toward the Turkish border and raised alarms with the United Nations and aid groups who fear a humanitarian disaster in the region. The Britain-based Syrian Observatory for Human Rights said Wednesday at least 500 people have been killed since the offensive began, including about 100 civilians. On Tuesday, U.N. humanitarian chief Stephen O'Brien said he is gravely concerned about what is happening in Aleppo and how the fighting is affecting aid access to the city. "It is absolutely clear that we need to continue to stress that the highest need and the best humanitarian response is for the bombing to stop, and secondly to ensure that the border is open for people to be able to cross and for supplies to get in," he said. U.S. State Department spokesman John Kirby said the situation in northern Syria is getting worse and reiterated criticism of Russia's air campaign. "It would be a lot less worse if the Russians weren't continuing to bomb opposition groups and civilians and civilian infrastructure," Kirby said. "That would be a big help to try -- to alleviating this problem along the border. That's a real, immediate thing that could happen. A cease-fire would do wonders to help alleviate that concern." Russia has repeatedly rejected criticism of its military operations in Syria, which began in late September backing President Bashar al-Assad's troops. 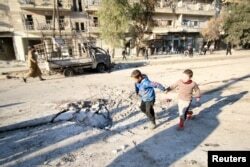 Rebel groups have said they want the bombing to stop before they will consider returning to U.N.-sponsored peace talks. Turkish Prime Minister Ahmet Davutoglu on Tuesday urged the international community to speak out against Russia for "mercilessly" attacking civilian targets in Syria. He also said his country has not closed its borders to more refugees, though it has not admitted the wave of Syrians who have arrived in the past few weeks. The tens of thousands of people displaced by violence are in the area close to the Bab al-Salam border crossing. The World Food Program says it is distributing urgently needed food to 21,000 people over the next few days in the nearby town of A'zaz and is concerned about the potential severing of supply routes from the north into Aleppo. Doctors Without Borders also says it has increased its operations in the same region and expressed fears about "an impending food, water and fuel crisis in the coming weeks" in Aleppo. The group said three of its facilities near the front lines in northern Syria have been hit by bombs in recent weeks. U.S. Secretary of State John Kerry and Russian Foreign Minister Sergei Lavrov are due to meet Thursday in Munich as a group of international powers works to restart the peace process after the U.N. suspended talks last week. Leaders have continued to stress the need for a political solution to the Syrian crisis, while forces from more than a dozen nations take part in military operations that have so far included no deployments of foreign ground troops. 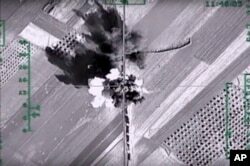 The United States has been leading a multi-nation coalition carrying out airstrikes against Islamic State in both Iraq and Syria for a year and a half, but some critics of President Barack Obama's strategy have advocated adding ground troops to meet his goal of defeating the militants. Obama's top official for the campaign against Islamic State, Brett McGurk, will likely face tough questions Wednesday when he goes before a House Foreign Affairs Committee hearing.